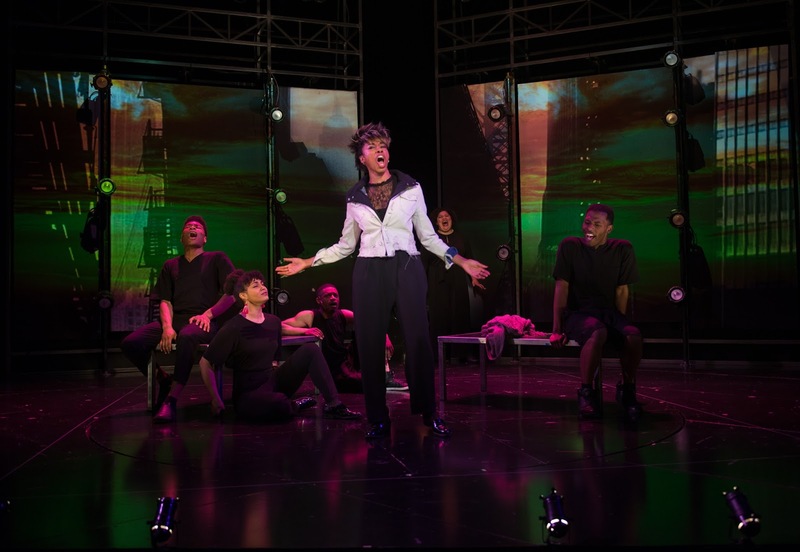 GIRL Shakes Loose is the final show in Penumbra Theatre's 40th anniversary season, and it's an ambitious, engaging, and energetic world premiere musical that explores modern, black female identity. 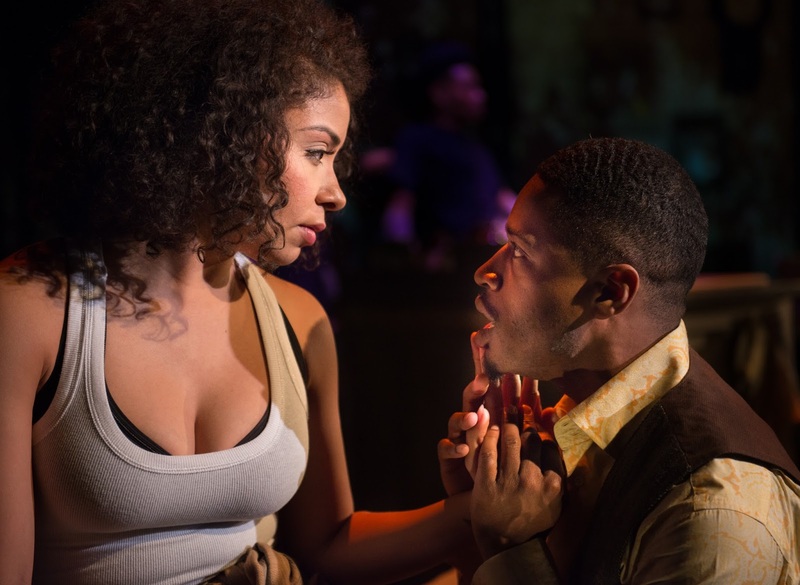 This intimate new musical by Imani Uzuri (music & lyrics) and Zakiyyah Alexander (book & lyrics) includes the words of poet Sonia Sanchez, whose work is grounded in the Black Arts Movement of the 1960s. 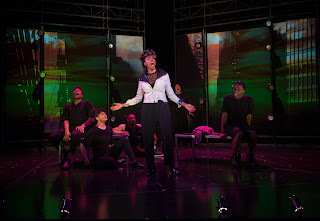 Directed by May Adrales, this is a rare show that has a creative team comprised of all women of color. Alexis Sims and the plaid shirt. "That we are investing in the representation of ourselves, our lives, how we love, and who we love with such tenderness, excellence and ferocity is to be widely celebrated. GIRL Shakes Loose truly is #blackgirlmagic!" The cast of GIRL Shakes Loose. All hail Jamecia Bennett. 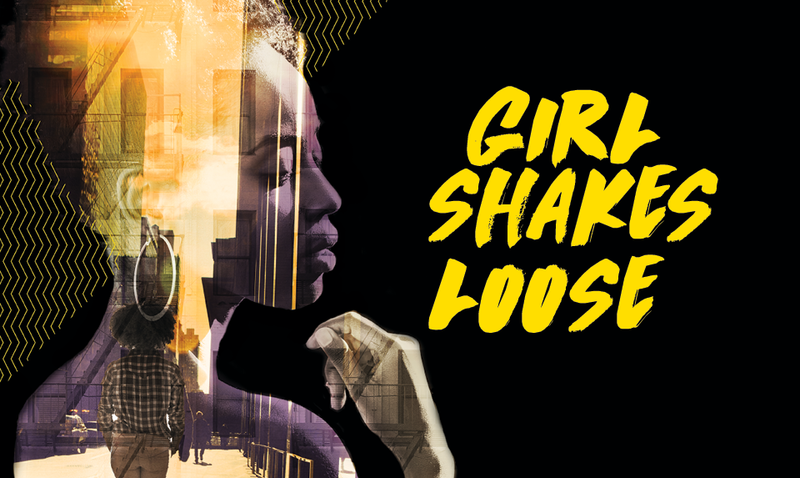 The story of GIRL Shakes Loose isn't groundbreaking, except that it's being told about a young woman of color. The title character, simply called GIRL, is a young black woman at a crossroads in her life. She has worked hard for success, attending a good college, obtaining a graduate degree, and running her own start up in Oakland, California. When her company goes bust, she loses any sense of who she is, and has to learn whether her life is worthwhile without the career success she worked so hard to get. Meanwhile, her love affairs are in equal disarray. GIRL heads to New York, and then to Atlanta to attend a family funeral, all the while figuring out what home really means. Alexis Sims and Kory Pullam. As played by Alexis Sims, GIRL is quite sympathetic, even when she's feeling very sorry for herself. It helps that her moping isn't indulged by her friends, or by her family when she goes back to Georgia. She has an engaging spark of energy, and her voice is, quite simply, exceptional. 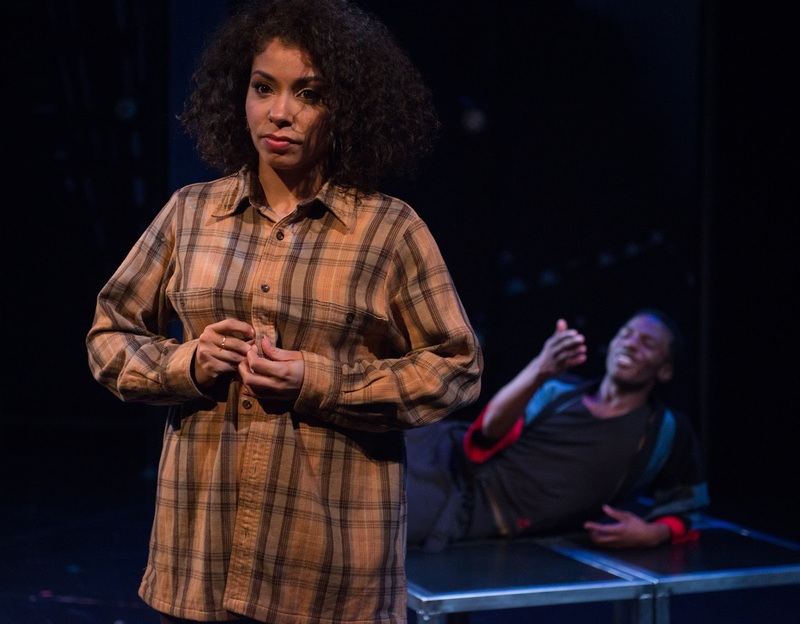 Jamecia Bennett brings her considerable talents to bear as GIRL's aunt, who tries to reunite her niece with the mother she hasn't seen in years. Thomasina Petrus is, as always, terrific as the mother who feels abandoned by her child but can't bear to condemn her. 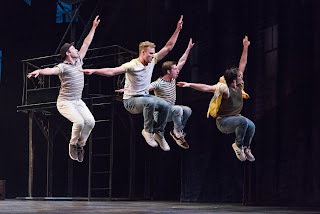 Bennett and Petrus also stand out as singers in the eight-member ensemble which musically accompanies GIRL's journey and play the people she meets along the way. A few standouts: John Jamison is very funny as a friend whose couch she crashes on, and he has an amazing singing voice which I hope to hear again soon. Kory Pullam, wonderful in so many local productions of the last few years at Pillsbury House, the Guthrie, as well as a standout role in Choir Boy, is compelling as an old love, while Tatiana Williams shows tenderness as well as anger as a more recent lover. China Brickey, Lamar Jefferson, and Valencia Proctor also bring beautiful voices to the mix. Tatiana Williams rocks the house. 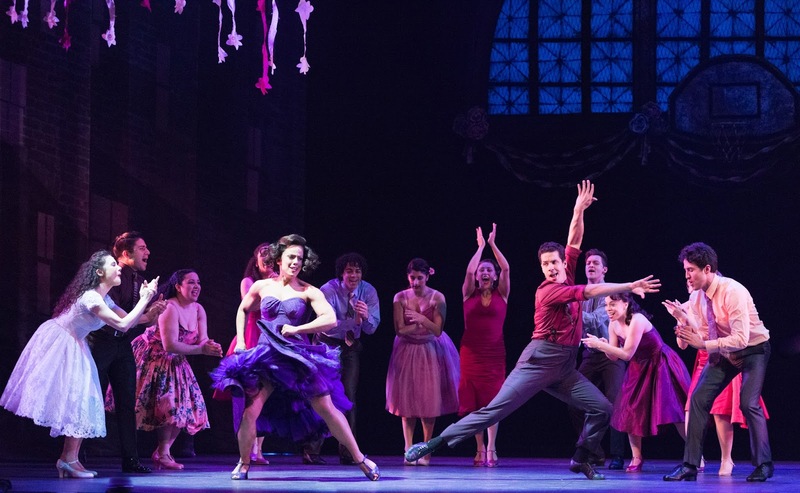 The music is contemporary, with detours into gospel, doo-wop, R & B and other styles, with the strong ensemble present for most of the music and Sanford Moore leading the band from backstage. John Acaerrgui's sound design puts the voices front and center without being over-amplified. I wasn't exactly whistling when I left the theater, but I could see the music taking hold over a few listenings. 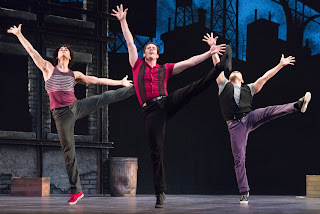 In intention, the show felt a little RENT-like to me. Possibly due to the minimal set and revolving cast of characters, and possibly due to a plaid shirt that outstays its welcome on stage. 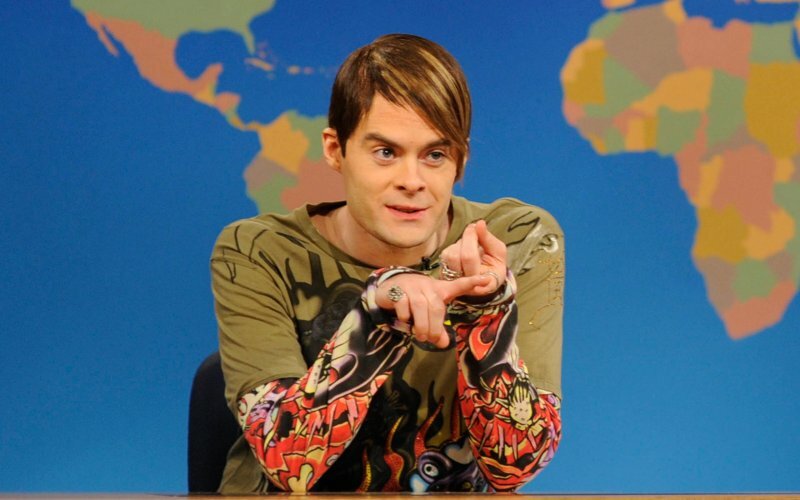 But I love that the show is trying something new, musically and narratively. 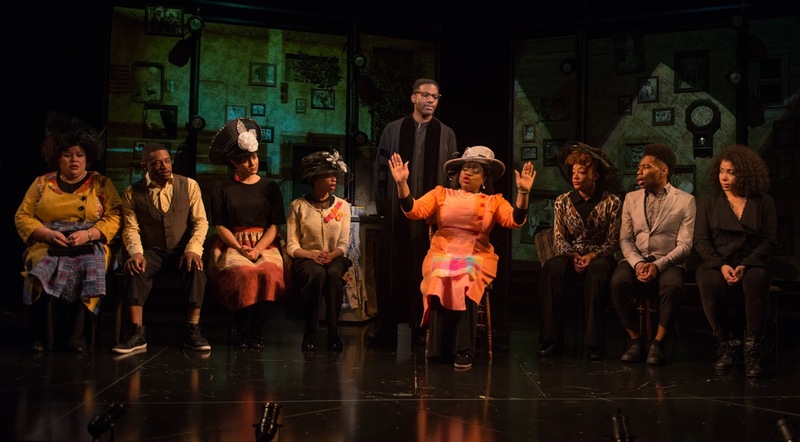 Not only is it telling the story of a young woman of color finding herself, it's also telling a story in which a person doesn't have to find someone else to find herself. This is pretty unusual in musical theater, and I applaud it wholeheartedly. Going into Pangea World Theater's new play at the Lab Theater, I knew next to nothing about Partition, the term used for the post-WWII division of formerly colonial India into the countries of India and Pakistan. Five Weeks: A Play About Divided Hearts, written by Meena Natarajan, is a heartrending, personal look at Partition and the many human costs that ensued. A bit about Partition: In 1947, the British government assigned a lawyer to draw the new border. Sir Cyril Radcliffe had no experience in India, or with drawing borders, and within five weeks, had drawn a border that allowed little consideration of demographics. Despite a stated intention to keep most Sikhs and Hindus in India and most Muslims in Pakistan, the reality was much more complicated. After thousands of years of coexistence, Partition divided up shared communities, neighborhoods, and social circles. As families migrated from one country to the other, about a million refugees were killed, millions more were displaced, and an estimated 75,000 women and children were raped and abducted, most of whom were never recovered. 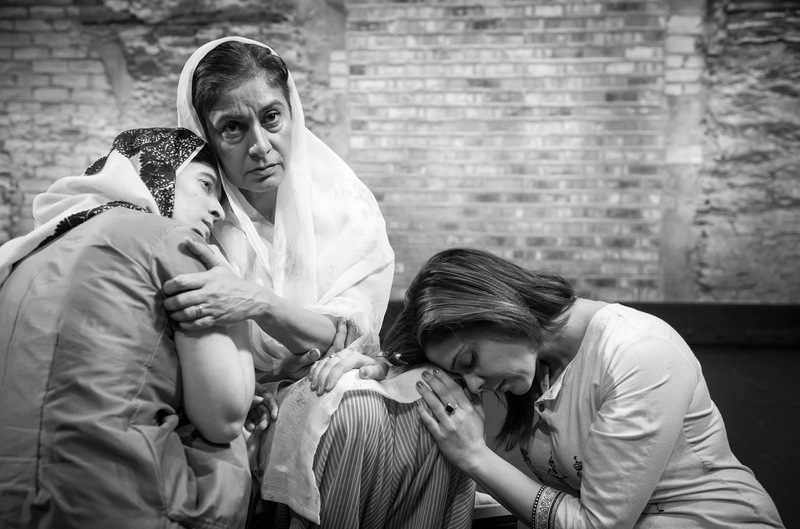 Natarajan's script weaves together stories of families and friends divided by Partition, bringing the massive carnage to a very personal level. A child is separated from her parents during their flight, a college-educated woman naively tries to help refugees, and a family finds its home no longer safe in just a few of the stories woven through the evening. Projected captions indicate place and time, and also provide translation of some of the dialogue, which includes Punjabi, Bengali, Hindi, and Urdu as well as English, sometimes in the same conversation. Live musical accompaniment is performed by singer Pooja Goswami Pavan, tabla player and vocalist A. Pavan, and keyboard player Vijay Rmanathan. Local actors of South Asian descent make up the acting ensemble and all play multiple characters. 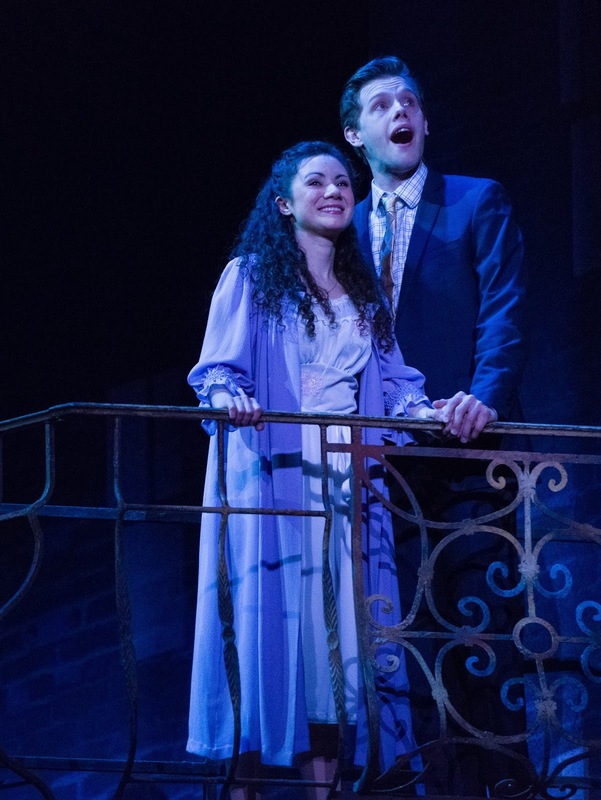 With a number of first time performers onstage, the performances can be a bit uneven, but the emotional resonance is clear. Madhu Bangalore, Tarun Kumar, and Prakshi Malik gave standout performances, imbuing each of their characters with incredible depth and emotion. If you'd like to learn more about Partition and its aftermath, Pangea's program is informative, and they also have an extensive study guide on their website. The website also features the personal stories of how Partition affected the cast members and their families, making it clear that this is not ancient history, but recent and real. The study guide and program also include a timeline, an explanation of terms used in the play, and a suggested reading list. Although I came to this play with very little knowledge about the situation, the stories and characters were incredibly moving and made me want to learn more. 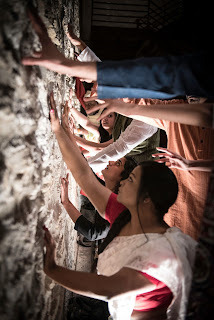 Pangea World Theater's mission is "Pangea illuminates the human condition, celebrates cultural differences, and promotes human rights by creating and presenting international, multi-disciplinary theater." 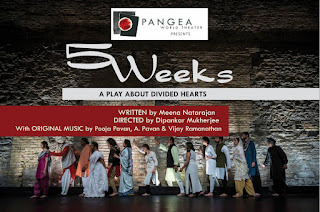 I think Five Weeks does all of these things beautifully, and I'll be following Pangea's work with interest. I've seldom been in an audience as incredibly rapt and attentive as at last night's production of Peter Brook's Battlefield at the Guthrie Theater. 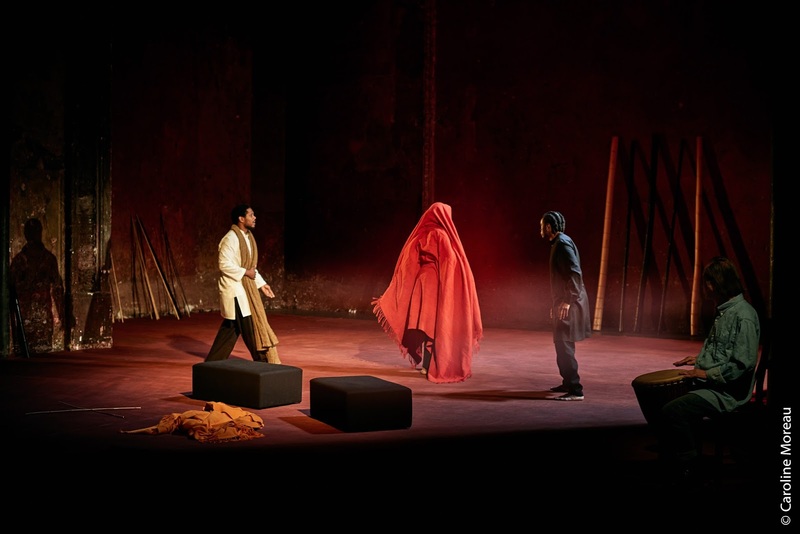 In 70 minutes, four actors and one musician, on a spare set, armed only with colored robes and sticks, tell a story from The Mahabharata about the aftermath of war and the meaning of time and life. This production, part of the Guthrie Worldstage Series, is one of the reasons why we are so fortunate to have the Guthrie Theater (under its fabulous new leadership) in the Twin Cities. 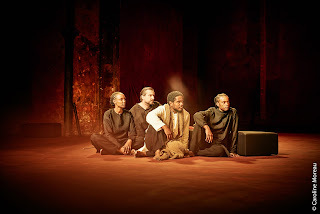 The opportunity to see a production by the acclaimed director Peter Brook, and to see this show, which premiered at the Young Vic in 2015, with the original cast, is a rare gift indeed. A bit of background: The Mahabarata is an epic poem that comprises a hundred thousand stanzas which was originally written in Sanskrit, sometime between 400 B.C. and 400 A.D. It's considered to be the longest literary work in existence. 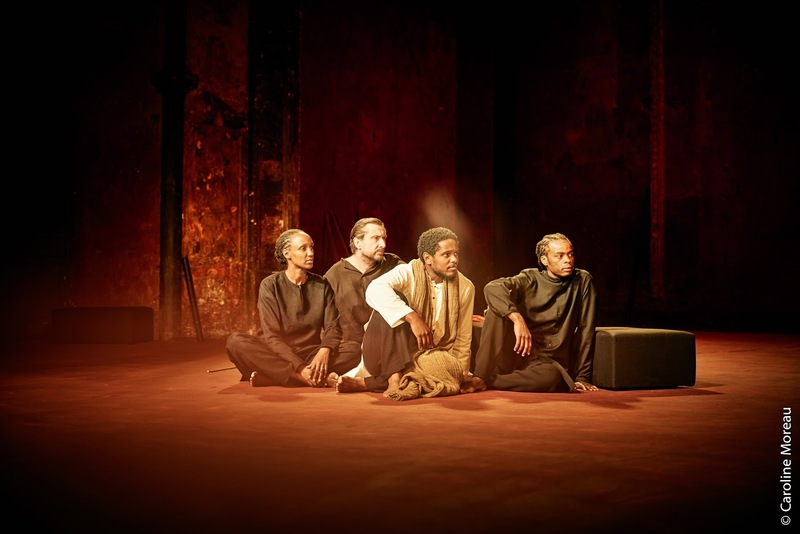 About 30 years ago, Peter Brook and his collaborator Marie-Hélène Estienne staged a nine-hour production of The Mahabharata, which was subsequently televised. In 2015, Brook and Estienne returned to this work to create Battlefield. Carole Karemera, Sean O'Callaghan, Jared McNeill and Ery Nzaramba. Now, inspired by the civil war in Syria, the 91-year-old director has decided to re-explore a part of that poem — but this time he's thinking small. Brook's new play, Battlefield, starts after a catastrophic war. "We wanted to concentrate on one thing only," he says. " ... What is the position of the great leader who realizes that he has done what he set out to do? He has won." At its surface, Battlefield is a story of rival factions of a ruling family struggling with the enormity of their war's destructive toll. At its soul, the show is a gorgeous, subtle plea for unity and a meditation on time, destiny and the meaning of a life fully lived. I'm not sure I can tell you any more than that about this show. 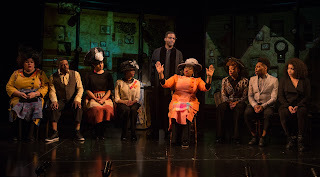 I can only say that this is an incredibly rare opportunity to see a truly great work of theater art by who is considered one of the world's best living theater directors. Also, I will tell you that I have seldom been more enraptured by a work of theater. 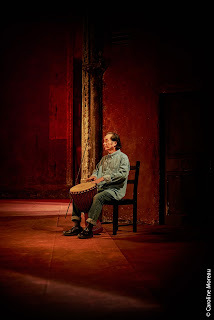 At times, I felt almost hypnotized by the performances and the storytelling. It's mesmerizing, and so stripped down. 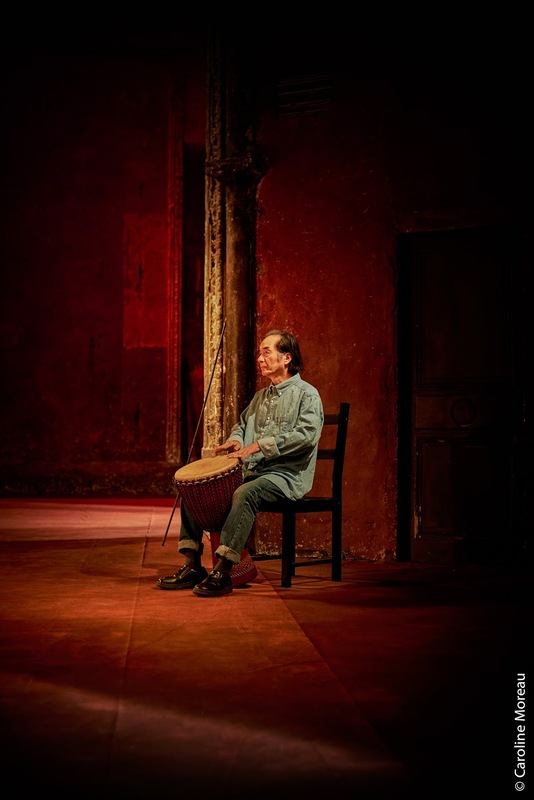 The musical accompaniment, by longtime Brook collaborator Toshi Tsuchitori, playing just one drum, lends the perfect tone to each scene. And the end? Holy cats, the end was truly stunning and unlike anything I've ever seen. The director shares one of his favorite parables, about a man in a perilous situation: "Hanging over a chasm, upside down, with a snake waiting to catch him underneath and an elephant about to trample him on the side. And in all this, suddenly, the possibility of tasting for the last time a drop of honey. A drop of honey says something to all of us: that life is worth living, because life is there and it is beyond the horrors."